Fibrous histiocytoma is the most common primary mesenchymal orbital tumor in adults. It may involve ocular structures such as the orbit, lids, conjuctiva, and ocular limbus. Most fibrous histiocytomas are benign, but some are locally aggressive and malignant. Malignant fibrous histiocytoma can develop after ocular irradiation for heritable retinoblastoma. A recent review of orbital tumors at the Armed Forces Institute of Pathology has shown that fibrous histiocytoma is the most common primary mesenchymal orbital tumor in adults. It may involve ocular structures such as the orbit, lids, conjuctiva, and ocular limbus. Most fibrous histiocytomas are benign, but some are locally aggressive and malignant. It is usually seen in middle-aged patients (40-60 years). 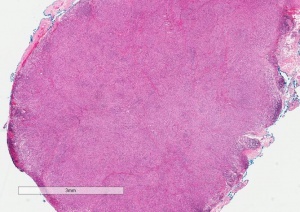 Classification of fibrous histiocytoma has changed over the past few decades, and is now believed to be part of a spectrum of tumors known as solitary fibrous tumors. The site of origin is thought to be a histiocyte or fibroblast, it is most likely a primitive mesenchymal cell with divergent differentiation that expresses fibroblastic, histiocytic, and myofibroblastic phenotypes. Malignant fibrous histiocytoma can develop after ocular irradiation for heritable retinoblastoma. 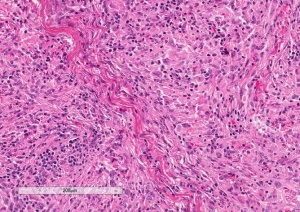 Histologically, fibrous histiocytoma is a mixture of spindle-shaped fibroblasts and histiocytes arranged in "storiform" or cartwheel-like pattern. Pathologic analysis and diagnosis are often challenging, usually based on a combination of light microscopy, immunohistochemistry, and electron microscopic findings. Fibrous histiocytoma stains positive for vimentin. Based on pathologic criteria, orbital fibrous histiocytoma has been divided into benign (~60% incidence) and malignant (~40%) categories. Avoidance of orbital radiation in patients who are affected by hereditary retinoblastoma is the only known environmental factor in preventing fibrous histiocytoma. Orbital fibrous histiocytoma can occur in adulthood or childhood. It appears as a circumscribed, homogeneous, soft tissue orbital mass that can produce proptosis and decrease in vision. Although it can occur anywhere in the orbit, it is usually confined to the orbital soft tissues. Differentiating fibrous histiocytoma from other common orbital tumors may present a diagnostic dilemma even with advanced time-resolved contrast imaging. In rare circumstances, it can invade the globe. Patients typically present with painless proptosis and a mass on orbital imaging. One study shows that most common signs and symptoms were proptosis (60 %), mass (46%), and decreased vision (25%). A complete eye exam with measurement of exophthalmos and retropulsion. Proptosis (or bulging of the eye). Decreased vision, dry eye, or other symptoms resulting from proptois may occur. History, imaging, physical examination, and high clinical suspicion are required to make the diagnosis of fibrous histiocytoma. Orbital CT, MRI, and/or time-resolved contrast kinetics imaging, will demonstrate a well-circumscribed soft tissue mass. It can mimic a schwannoma or cavernous hemangioma. It rarely erodes bone or extends into the cranium. Biopsy with special immunohistochemistry staining is required to make a definitive diagnosis. Cavernous hemangioma, rhabdomyosarcoma, hemangiopericytoma, schwannoma, and other orbital tumors should be included in the differential diagnosis. The preferred management is complete surgical resection of the mass within its capsule. The literature has reported that incomplete excision can lead to recurrence of disease and malignant transformation in some cases. Advanced cases may require orbital exteneration or irradiation. Complete surgical excision is the treatment of choice. Exenteration may be required in advanced cases. Chemotherapy and radiotherapy have so far been limited in the treatment of fibrous histiocytoma. Orbital surgery should be performed by a qualified oculoplastic surgeon. The surgeon will choose the best approach to the orbit based on the location of the tumor, with the goal of complete excision. With invasive tumors, orbital exenteration may be required. The ten-year survival of patients with benign, locally aggressive, and malignant fibrous histiocytoma was 100 per cent, 92 per cent, and 23 per cent, respectively. Retrobulbar hemorrhage, infection, loss of vision, incomplete excision, recurrence with malignant transformation, and loss of the eye are potential complications of orbital surgery. The rate of recurrence was 31 per cent for the benign tumors, 57 per cent for the locally aggressive tumors, and 64 per cent for the malignant tumors in one study. American Academy of Ophthalmology. Oculoplastics/Orbit: Fibrous histiocytoma Practicing Ophthalmologists Learning System, 2017 - 2019 San Francisco: American Academy of Ophthalmology, 2017. ↑ Shields, Jerry. Shields, Carol. Eyelid, Conjuctival, and Orbtial Tumors. Lippincott Williams and Wilkins. 2008. ↑ Yanoff, M. Sassani, J.W. Ocular Pathology sixth edition. Elsevier 2009. ↑ Warner EJ, Burkat CN, Gentry LR. Orbital fibrous histiocytoma mimicking cavernous hemangioma on dynamic contrast-enhanced MRA imaging. Ophthal Plast Reconstr Surg. 2013 Jan-Feb;29(1):e3-5. doi: 10.1097/IOP.0b013e31825412f7. ↑ Font RL, Hidayat AA. Fibrous histiocytoma of the orbit. A clinicopathologic study of 150 cases. Hum Pathol. 1982 Mar;13(3):199-209. This page was last modified on October 2, 2018, at 10:24.